Buy Gaea Organic Whole Kalamata Olives - 300g in the UK from our online shop or directly from our independent Scottish store. GAEA organic whole Kalamata olives come from the famous Kalamata region and are handpicked from organically cultivated trees. Another tasty way of eating sauerkraut. Sauerkraut is lacto-fermented so shouldn't contain vinegar! Our sauerkraut is raw and real! This recipe contains 100 g stoned black olives, halved. We sell real Gaea and other Miscelanious Ingredients directly from our shop in Scotland and online throughout the UK. View more products from Gaea. Where can you buy real Organic Kalamata Olives safely online? If you are wondering where you can buy Gaea Organic Whole Kalamata Olives - 300g safely online in the UK, then shop with us. We are an actual health foods shop; with real people selling real foods and products. Our award-winning independent shop is located in Stirling, Scotland since 1976. You can buy our Miscelanious Ingredients in store or safely place an order with us online or over the phone. 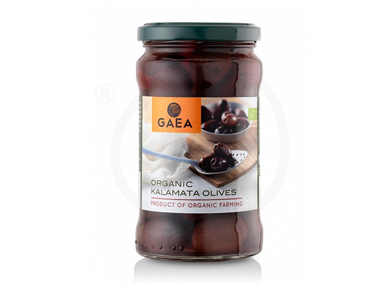 Organic Kalamata Olives - Gaea Organic Whole Kalamata Olives - 300g in Miscelanious Ingredients and Foods.